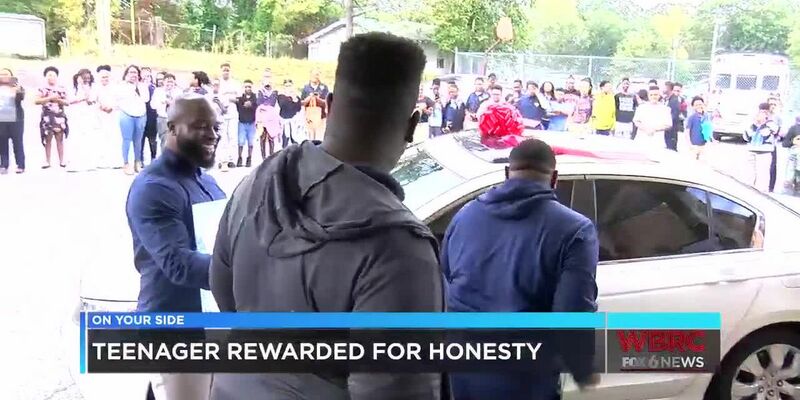 BIRMINGHAM, AL (WBRC) -A Birmingham area high school student whose good deed went viral on social media was rewarded Wednesday for simply doing the right thing. Antoine Starr was working at the Piggly Wiggly in Forestdale when he found a woman’s purse with almost $300 in it and immediately returned it. That woman, Sheila Spencer, gave Starr a $100 reward and her Facebook post caught the attention of thousands. Among those who heard the story was the owner of H&H Contractors who worked with Central Park Christian Academy to provide Starr a a 2008 Honda Accord. Starr’s mother her son’s behavior was normal and he was doing what his parents and the school have taught him. But school leaders say they wanted to send a message. “Here’s a kid who did it the right way and I wanted to find a way to show this younger generation that living right pays off", said Mike McClure Jr, the pastor at Central Park Christian Academy. Starr plans to attend Tennessee State University and become a chemical engineer.